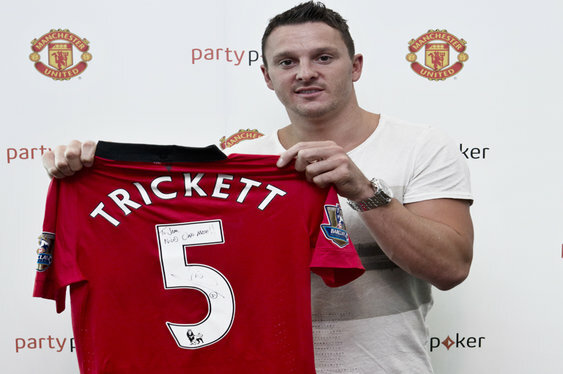 As well as being arguably Britain's best poker player Sam Trickett is also a massive Manchester United fan and last year's WSOP Big One for One Drop runner up managed to mix business with pleasure over the weekend by taking down a tournament at Old Trafford. really happy to win this event – I played for fun but I felt I really had to win at Old Trafford – I made it my mission!” said Sam. PartyPoker's Road To Old Trafford tournament featured a selection of amateur qualifiers, top pros such as Trickett as well as former United favourites Dwight Yorke, Quinton Fortune and Norman Whiteside. Former England skipper Bryan Robson also took part and thoroughly enjoyed his efforts on the felt. “It seemed like everyone really enjoyed the event – Old Trafford is really a magical place. There was a great fun atmosphere and I was happy to be part of it.” said Robson. Throw in a visit to the club's Carrington training base and being given a special, signed shirt and it sounds like the perfect few days for Sam.